Preheat oven to 350 degrees. In a large bowl mix everything together except the honey and the vanilla. Line baking sheet with parchment paper. Spread nuts with spices and oil on baking sheet. Bake for 2-3 minutes. While that is baking mix honey and vanilla. 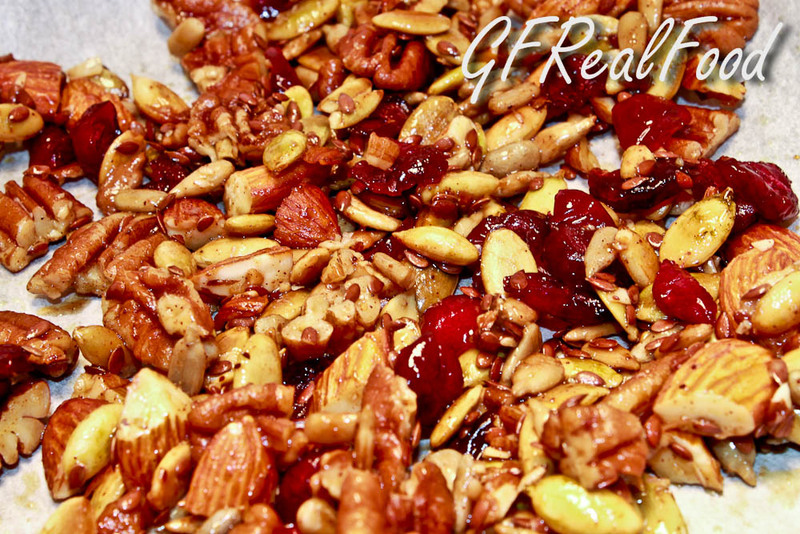 Then pour the honey and vanilla mix over top of the nuts and mix well. Put nuts back into the oven for about 10 minutes. Every 2-3 minutes stir nuts. Watch that they don’t burn as they can burn quickly. When most of the honey mix has reduced they are done. They will still appear wet when hot but when they cool the honey hardens and dries. Add cranberries or other dried fruit when still hot and mix well. Allow to cool before serving. « Coconut Palm Sugar – Friend or Foe? I love mixes like this. I’ll often make these and switch out the cinnamon with cayenne pepper. Although there is nothing like cinnamon! Do you mean plain dried cranberries not Craisins? Just thinking of the amount of sugar in Craisins. Or is there a difference between the two? I had some organic ones that were sweetened with evaporated cane juice…aka sugar. You’re right though, they generally have a lot of sugar in them but I didn’t think I could get the kids to eat unsweetened ones. As much as I like this trail mix I am not eating it. Carbs are too high. Long time no hear. How have you been?